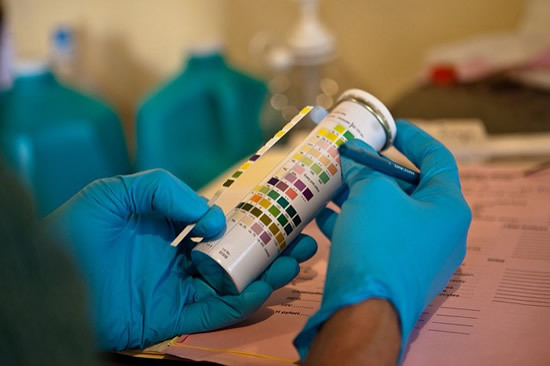 Color tests, for example, are preliminary tests which involve the reaction of a drug sample, a protein free filtrate or an extract with a reagent or a series of reagents to produce a color or change in color. These tests are rapid and simple, do not require sophisticated equipment, require minimal training and a small sample to perform. Presumptive tests may be useful in certain situations, but in others, it may create a lot of psychological, social, and legal problems. A negative test may be used to rule out a drug or drug intoxication. A positive test is usually indicative of a class or classes of drugs rather than a specific drug. The results, however, are reported as positive for a specific drug. Without confirmatory testing, a positive presumptive test result can easily be misinterpreted. Presumptive tests should be thought of as screening tests only, indicating that confirmatory testing (usually a more expensive and slower process) is indicated. Cross reactivity is one of the biggest concerns with presumptive testing. For example, a urine drug screen can show positive for amphetamines from buproprion metabolites (a common antidepressant and smoking cessation aid), decongestants, ephedrine, methamphetamine, and selegiline (used for Parkinson's disease) (Saitman, Park, & Fitzgerald, 2014). Urine drug screens are performed routinely in emergency departments when patients come in with altered mental status. These are medical tests for medical purposes, not forensic tests. A false positive drug test though can have consequences, however, even if it is as subtle as hospital staff subconsciously treating the patient differently. Another example is where urine drug screen results are confused due to cross reactivity is PCP. PCP is a drug that is tested for in the emergency room urine drug screen, even though it isn't a very common drug amongst drug users anymore. PCP can cause symptoms of psychosis, so it can be an important drug to test for in certain clinical scenarios. Presumptive tests for PCP can be interpreted as positive by reactions to drugs such as ketamine, venlafaxine (a common antidepressant), dextromethorphan (a common cough suppressant), diphenhydramine (a common allergy medication/antihistamine), and tramadol (a common pain medication) (Saitman et al., 2014). I have personally seen several times a positive PCP result, and then learned that the patient had been taking cold medication. A day or two later (sometimes longer) I would get the confirmatory results indicating that the test was actually negative for PCP. The utility of having a presumptive test without rapid confirmatory testing available is quite questionable because a positive result can just create confusion. A medical test in an emergency room can lead to poor medical decision making. A forensic test may lead to someone being kept in custody, either waiting for confirmatory testing, or in some jurisdictions charges may even be given based on presumptive results. Using the outcome of presumptive testing without confirmatory testing as evidence to charge an accused in a drug case is a bad practice. When presumptive testing information alone is available, there usually isn't an expert available to appropriately interpret the result. Presumptive tests are intentionally designed to be screening tests and to have high false positive rates. Predictive modeling shows that when a condition is not very likely, and there is high sensitivity but low specificity (such as in presumptive testing), a positive result is essentially meaningless. This is usually the situation when panels of tests are being performed, which is not a good practice and a set up for making bad decisions based on bad information. If a condition is rare, and the test is very specific and sensitive, most positives will still be false positives, but this information can still be useful if the rare condition is of such significance that we would not want to miss it. This is how some disease screening tests are designed and used. When suspicion for a condition is high, and a presumptive test is positive, the information from the presumptive test isn't might not be much better than the initial suspicion not increase the prediction much. These are all things that should be considered prior to making decisions when having a positive presumptive test result without confirmatory results. Important decisions should generally be deferred until confirmatory testing results are available. Saitman, A., Park, H., & Fitzgerald, R. L. (2014). False-Positive Interferences of Common Urine Drug Screen Immunoassays: A Review. Journal of Analytical Toxicology, 38(7), 387-396.